Welcome to the Motorama Kia Blog. You will find a growing list of articles that ensure you get the most out of your automotive needs. Feel free to browse through our categories and articles! Kia is well knows as a major sponsor of tennis in Australia and Motorama Kia represents those interest locally in Brisbane. We drove the Kia Picanto Australian Open Edition to the Queensland Tennis Centre. The market for mid-sized SUV’s is a crowded one. At the same time, it’s a popular segment with lots to gain. How does the new Kia Sportage hold up against the fierce competition? We decided to find out. 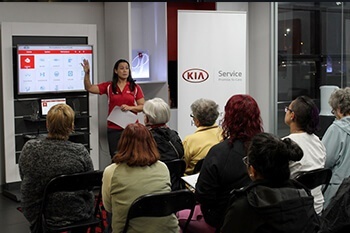 Just a few months ago Motorama started the construction of a new Kia dealership in Moorooka. Last night, we officially opened the striking, flag ship new home of Kia on Moorooka’s Magic Mile. The Kia Cerato Sedan is the first of the Cerato family to get a full makeover. We took the big brother of the Hatchback to the street to see if size matters. A rear-wheel drive sports tourer from Kia? Believe it. We took the game-changing South Korean out for a drive. The Kia Sorento has been a standout family sized SUV, and now comes with a punching new GT Line edition. We took it out to see if it is worth putting on your shopping list. The Kia Stinger will hit Brisbane, and Motorama Kia will be one of the first dealerships letting you drive away in the new sports sedan. The calendar at Motorama is chock full of new cars arriving on the showroom floor. Here’s a list of all the new Kia’s arriving.